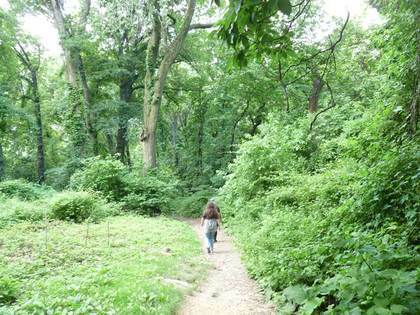 A stark illustration of this Mosesian philosophy can be found in the maze of park walks leading to one of NYC’s most beloved landmarks, the Little Red Lighthouse, or, more properly, the Jeffreys Hook Lighthouse. 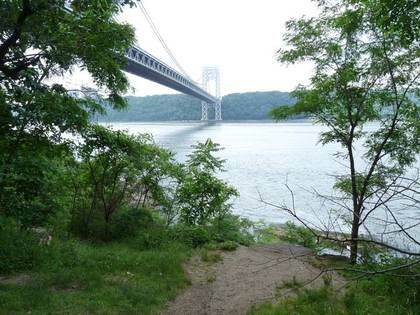 It’s located on the water’s edge immediately south of the George Washington Bridge. You'd think the city would have long ago improved the methods pedestrians must use to reach this prime attraction, but you'd be wrong. Descend a ramp that leads to a 1930s-era arch stone bridge, that crosses a northbound lane of Riverside/Hudson. There are tablets on the railway decorated with Neptunian tridents, a lifesaver, ropes, and a shell, probably in honor of the nearby river. Another ramp, missing its original lamp stanchions, descends from the bridge into a southbound ramp trailing along another of the northbound traffic bridges. 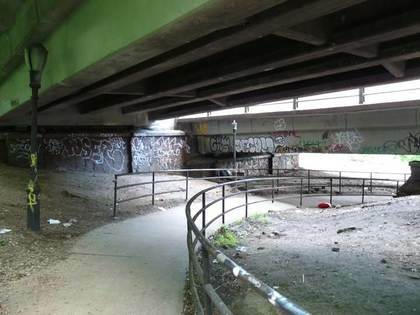 This in turn curves under the roadway bridge, entering a Stygian region of broken glass, broken sidewalks and long-unrepaired walkway lighting. 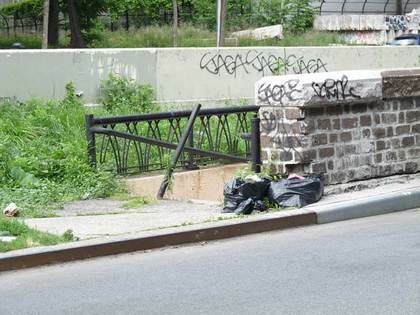 You come out at a bustling surface roadway, with splintered park benches, uprooted trees, and concrete slabs (likely from the retaining wall) lying around. There’s a lamp bearing signs for both Riverside Drive and Henry Hudson Parkway. I feel more and more at home by the minute. Truly I am in forgotten realms. A nearby staircase seems to lead up to what appears to be a blocked-up shrine to some unknown deity. While contemplating how to get across 3 lanes of busy traffic, the issue was settled when I spied a staircase with a rusty handrail and a pile of uncollected garbage. That was the way to get past the roadway. The talismanic scrawlings of the local youth decorate the walls. Incidentally, it would be pointless for the city to spruce up these paths, and re-install lighting. A round-the-clock police presence, and the unavoidable complaints about the police presence, would be necessitated to maintain these paths in any sort of safe and well-lit conditions. 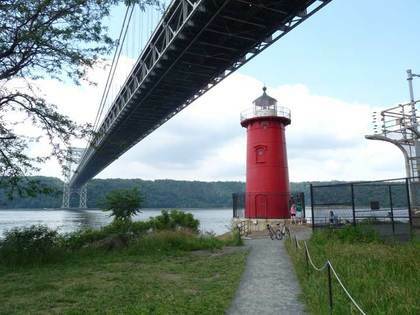 You emerge onto a paved path, but it eventually loses the pavement as you head south and then hugs the Henry Hudson Parkway, but doesn’t go to the Lighthouse. 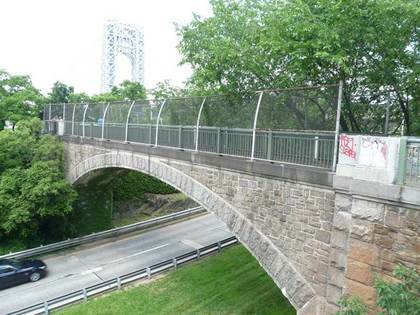 You actually need to head north from the tunnel and go under the George Washington Bridge and go beneath another stone arch that takes you under the northbound roadway of the Henry Hudson Parkway. We seem to be in civilization again, and there are more people to be seen. The path runs on a seemingly flimsy, yet rather charming, wood-surface bridge over Amtrak, formerly NY Central. After clearing the railroad you have breached the final barrier to the waterfront, just about. Care must be taken from here when sneaking a view of the Bridge and the Hudson River. We’re at the edge of a steep cliff, and through some oversight, this section isn’t fenced off. At last, the quarry has been attained, the Little Red, or Jeffrey’s Hook, Lighthouse, which is accompanied by a picnic area and a bored guard who tells you to not take any close up pictures of the bridge tower. 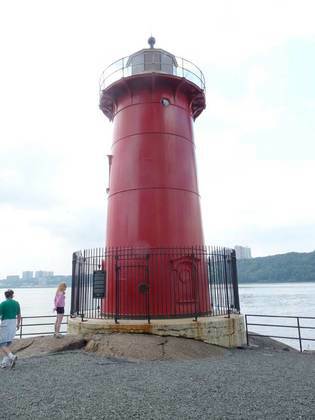 Like many NYC folks of a certain age, I first became aware of the Lighthouse from Captain Kangaroo. Before or after receiving a pingpong-ball shower from Bunny Rabbit, the Captain would sometimes read from a 1942 children’s book by Hildegarde Swift and Lynd Ward called The Little Red Lighthouse and the Great Gray Bridge, which remains in print. In the book, the lighthouse becomes despondent when the bridge is built next door, feeling its purpose has been taken away. During a foggy night, the Bridge is able to light the way for aircraft while the Lighthouse aids shipping, giving the lesson that everyone has their purpose in life, no matter how seemingly inconsequential. The 40-foot tall Lighthouse was first built in 1880 and served as the North Hook Beacon off Sandy Hook, NJ in that role until 1917. It was thought obsolete at that point—and was in the line of fire from gun batteries at Fort Hancock at a time when a German invasion was not out of the question—and placed into storage, but it was reassembled in 1921 and placed here at Jeffreys Hook, then considered a dangerous spot for shipping. 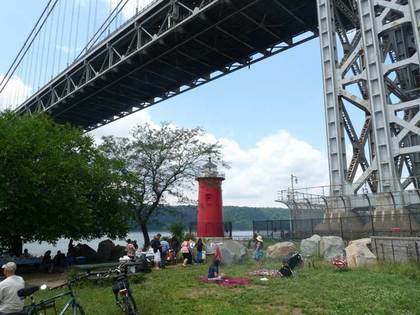 The Lighthouse was overshadowed by the GWB in 1931, was decommissioned in 1947, and there was thought of demolition by 1951. However the public remembered Swift and Ward’s book, and petitioned the city for its survival. By the end of that year the Lighthouse was under the jurisdiction of the NYC Department of Parks (headed by one Robert Moses). The Lighthouse (no longer in official use, but still active) uses a blinking acteylene lamp focused by a 5th order Fresnel lens of cut glass prisms. The Lighthouse employs one second of light followed by two seconds of darkness: every active lighthouse uses a specific sequence of light and darkness. It also has a fog bell.